The profile of women's cyclocross continues to grow and recent rule changes have helped to create an exciting future for both the current generation and those set to follow. Oskar Scarsbrook interviewed young British international Hannah Payton as her season got underway. Photos: Jan Watts & Jack Chevell. HANNAH Payton is a young up-and-coming British cyclocross star who has won the opening two rounds of the British national series and has been building her experience at world-level..
With several seasons of World Cup racing now behind her, Payton crossed the Atlantic at the start of this season and finished 27th in the Cross Vegas World Cup and repeated the same 27th place in the second round of the World Cup in Valkenburg. 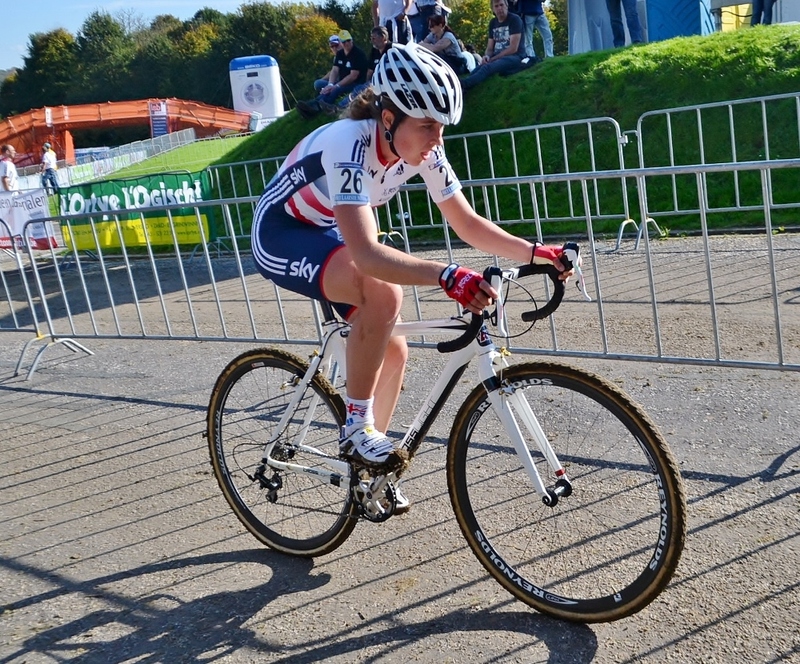 Efforts 'behind the scenes' to improve women's cyclocross, by people including UCI Commission member Helen Wyman, have also helped create two new championship race opportunities for Hannah in the under-23 category this season. Hannah winning a round of her local West Midlands League recently. Photo: Jan Watts. We sat down and discussed her racing, inspirations and how the rest of the season will look for the twenty-one-year-old from the English Midlands. Well done on your wins in Southampton and Derby. Will you be able to target the British National Trophy fully this season as well as your World Cup racing? Thanks. I'm planning to do two more British Trophy races, possibly three, but I can't do the complete series as one round clashes with the Europeans and another with a World Cup round. It's a shame of course because I've started by winning and holdingthe yellow (series leader) jersey, but there are some bigger and better races out there to do. Is it correct that you crowdfunded your racing trip to CrossVegas last month? Yes. Helen Wyman helped me out a lot at the end of last season so in February and March we set up a 'GoFundMe' account and tried to raise enough money for me to get out to Las Vegas for the first round of the World Cup. We succeeded and lots of people contributed a lot of money which was really amazing. How long were you in the States - for CrossVegas only or for other races? Well the second World Cup round was supposed to be Montreal, but that got cancelled of course as there wasn't enough funding. I'd already booked my flights (to Canada) so I flew there anyway and then took up some pre-arranged host housing in Vermont which was really good. I was there for another week and they kindly took me to Boston to do the two-day GP Gloucester. Is Vegas as crazy as it appears? Vegas is really crazy yes. It's not really the kind of place I'd like to go back to as a tourist. We went on the strip once and that was enough. It was a really good experience though and once you get out of the town and into the desert and the mountains it's really nice riding. What races will you be doing on the continent this season? I'm doing the full World Cup series and I'm doing quite a lot of the Superprestige and BPost Bank Trofee races. My main targets are the European Championship (on November 7th) and then obviously the World Championship because there are under-23 categories in both of them now. It's also just been announced that there'll be a new under-23 race at the (British) National Championships so I've swapped my plan around a bit because that adds in another one to peak for. So winning the national champion's jersey is a goal that wasn't originally on your season plan? Well, without the new category a champion's jersey was only in the very back of my mind because it's not realistic for me to try and beat the likes of Helen Wyman and Nikki Harris so I'd be just going for the podium. I wasn't going for the hooped (champion's) jersey, but now there's a separate under-23 women's race it could be a chance to win another one (Hannah was twice the British junior champion in 2011 and 2012). Helen Wyman was always a bit of a hero of mine... an incredible rider in my eyes and now she's become a friend. What's it like having riders such as Nikki Harris and Helen Wyman as international team mates? Helen Wyman was always a bit of a hero of mine when I was younger. As a young racer she was just an incredible rider in my eyes and now she's become a friend. She really helps me out so I know her well now and she helped me a lot in America. She's still my inspiration. You come from a cycling family - do they get to see you race in Europe? My dad and brother both race 'cross and my mum cycles for pleasure so I have lots of support at home because they all understand the pressure of training and racing. They come to my races in Europe when they can. The journey from home (near Birmingham) to Belgium isn't too bad. My dad has been to China (for the Qiansen Trophy) with me twice and he came to Tabor for last years World Champs. He tries to follow me to my big races if it's possible too. Vegas this year was a bit too far though, ha ha. Hannah (left) gridded on the front row for last season's senior National Championship where she finished sixth. Photo: Jack Chevell. How is the relationship with your main sponsor Kinesis UK? I've ridden for Kinesis for the last three years now and this year they've kind of upped their game and upped my sponsorship so we've got a really good relationship. Bruce (Dalton) is a friend as well as a team manager (and team mate). That's really nice and they have been really supportive of me. What are your favourite races of the year, on the continent and at home? I really like Shrewsbury (UK) which is good because it's where the national champs are this season. Abroad, I think Koksijde's a really good race with a great atmosphere and popular with a lot of British people because it's so close. I've grown to like the sand more and more. There are no sandy races in the UK so I learnt the hard way when I first went to Belgium – in the many sandy races there. After finishing twelve in Ardooie (on October 15th) were you a little bit disappointed with 27th place in Valkenburg? The two races aren't really that comparable with it being a much stronger and world-class field at the World Cup. My aim was to finish top 30 in Valkenburg and so I achieved that. Saying that I am a little disappointed because I had ten riders not that far ahead of me and with a stronger last lap I could have been even higher up. Can you remember your first trip to Europe representing Great Britain? My first race was at Koksijde when I was first year junior and I got pulled with two laps to go. The difference between racing in the UK and racing Marianne Vos was a really big step up, but obviously it's helped me a lot and brought me on. It really was like throwing myself in at the deep end! We wish Hannah the best of luck for the rest of her season.